Completely renovated and redesigned, only the outside walls have remained unchanged : we have created a modern, tasteful, spacious interior and exposed the old beams in the living area. We have installed two completely new bath and shower rooms. The fitted kitchen is fully equipped (including dishwasher & washing machine). The windows of this 4th floor apartment look out over the most romantic views possible to San Marco in one direction and to the Lagoon, which can be clearly seen behind the church of Madonna dell'Orto in the other. The sleeping accommodation comprises a double room and another room with two single beds for maximum flexibility; these areas are finished in striking blue and red against the white walls. The sitting room (in one large space with the kitchen) has a dining area, and is finished in yellow and grey, with white walls and black beams. When you are in the apartment, it is a wrench to leave; to return after a day out in the city is a pleasure to look forward to! We have a series of stand fans for you to use in summer and which you can move from room to room as you require. Quiet with fantastic view onto Tintoretto's house, the famous Moors on Campo dei Mori, the local canals and over the rooftops as far as San Marco (and also way, way over the lagoon onto the snow-capped mountains when weather conditions permit). toilet, combination tub/shower, bidet, next to double room. so each bedroom has its own bathroom or shower room. You have your own outside Venetian clothes line. Wi-Fi is installed and fully working. It is, of course, free for you to enjoy. The living room is the main area you see on our first photo. It is light and spacious and looks out over the local canal to Madonna dell'Orto, the lagoon and the mountains beyond. Venice is a very special place, and its beauty is all its own. The most suitable visitors will be those who appreciate quiet, serene holidays and will not be looking for the high life, but will enjoy the apartment and the city for qualities other than those offered by most other destinations. We are ready to consider long lets, and are also not against (well-behaved!) pets. In addition, we will put a cot at the disposal of parents with small children, if this is asked well in advance. The access to the apartment is on foot only, and there are 5 flights of stairs up to the flat's front door. A pushchair could be left in the downstairs hall. Wi-Fi now fully installed and ready for you to use, free of charge of course. Stereo system with CD player, radio and iPod dock. Bring your iPod and play your own music as you relax, have a drink or eat. There are STAND FANS to cool you in summer time. We had a lovely stay in this apartment... very spacious and plenty of room for the two kids too. Just loved the views and being able to see some of the street life from the window, as well as over other areas of Venice. Everything we needed was here and more. There's pretty much utensils and items for just about anything you would need... and not just a standard set of 4 or 6 each... there were plenty of cups/plates etc, which means you don't have to washout cups every two minutes. It was nice to sit around the kitchen table for meals and relax in the lounge area and still have space. Every other time we've been in Venice we've stayed in a hotel or pensione and been limited to a tiny box like room with no space. Anthony and Michel's place certainly made up for that. Just a nice touch too to hear from the owner after checkin to make sure everything is going ok. Comprehensive instructions and details about local shops really helped us settle in quickly, get groceries and set up. And with two little kids that's no mean feat. We didn't mind walking up the stairs, and nor did the four-year-old kids... they just thought it was a fun game! And a couple of mossies floating around which didn't bother us too much either. That's about as negative we get, because the positives really outweigh everything else. We's love to come back and stay... and will be keeping this place at the top of our list. Recommend it. Thank you so much! We are very pleased to know that everything we try and do for our guests turns out to please :) We take a lot of care over staying in personal touch with our visitors, giving them tips both before they arrive and also answering any questions during the stay itself. Shopping tips, cultural visits, walks to markets, unusual things to do, restaurants, ice-cream parlours - you name it, we can usually help! Anyone reading this is more than welcome to come and try our hospitality for themselves, and use our space for the duration of their holiday. We look forward to hearing from you: we'll take great care of you and your family's requirements! Stayed here 4 nights with husband and two older children. 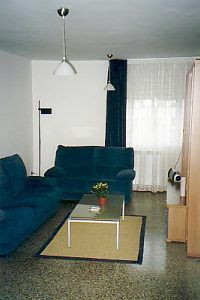 The apartment is well located close to vibrant shopping streets, but quiet at night. Very close to some lovely bars and restaurants. Nicely furnished, although parents with screen-addicted children be aware - No TV. Was fine by us - we read books, listened to music and - oh yeah - visited the bars and lovely restaurants. Note - the four flights of stairs with no lift can be a bit of a pain with groceries when you're pushing 50 and have (apparently) spent far to much time visiting bars and restaurants. Overall, very good value. Finally, no TV is also a conscious choice : but there is free wifi so bring your own tablet and watch whatever you want to your heart's content. This apartment locates in a quiet neighborhood but it is only 10-min walk to Rialto bridge. Anthony is a very responsive owner. He replies the email promptly. Just right before we departed to Europe, Anthony noticed us that a wireless internet access was installed. This let us stay communicated with friends. The instruction given by Anthony is perfect. The direction to the apartment is the most accurate route direction I've ever seen. We use the direction to the apartment without making any wrong turns. Thanks! We are delighted that it all worked out for you. All guests can rest assured that we will do everything we possibly can to make sure everyone feels at home and their stay is free of problems. As you see, we have wifi access now (FREE OF CHARGE) - all part of our policy of continual improvement. Please come and sample our hospitality for yourselves! This clean, simply furnished and well equipped apartment was the perfect base for our week in Venice. In this quiet part of Venice, where the local shops were used by locals and reasonably priced, our self catering was easy and enjoyable. Peter and Michel ensured that we enjoyed every moment of our week with quick and informative responses that allayed any worries! So long as you are ready to hideaway or explore Venice with its neighbouring islands, this apartment is excellent. Walking is a must whilst the stairs to the top floor add to the charm! Anthony was a great owner, always responded to any queries quickly. This is a large apartment and was just as described, if not better, the views from the all windows were great. Anthony keeps the flat spotless, plenty of restaurants close by. We travelled through Europe for 3 weeks and this was the best apartment we stay in. Thanks so much! We are so glad that our policy of immediate replies has pleased our guests - and we are sure it will please all future ones too. No-one wants to wait around to make their holiday plans, and we do always try to reply to all queries straightaway, and in any case within 24 hours. Everything about our stay in this lovely apartment was perfect. At the enquiry stage and throughout the booking process the owners could not have been more helpful. Most questions we had were answered by the very detailed information sheets they sent us, but they patiently answered our remaining queries cheerfully and with humour. When we arrived at the apartment, everything was as we had been given to expect. All we could possibly want was provided, and the absence of a TV set was a positive bonus for us. Our 11 and 13-year-old children would not have been able to resist the TV if one were there, but since there wasn't one they had the opportunity to rediscover the simple pleasure of a game of cards, and spent time reading and drawing. The location, for us, was unbeatable. A lovely, quiet neighbourhood, only 5 or 10 minutes' walk from the hustle and bustle of the more frequented areas, but right off the beaten tourist track so that we really felt a part of the local Cannaregio community for our 8-night stay. And the views from the apartment are simply delightful - you look down on the neighbouring canals, and across the red-tiled rooftops to the various campanile, including St Mark's, that are visible from the apartment. We would certainly recommend this apartment as an ideal base from which to explore the city - we're missing it already! We are really glad to hear that our efforts and our apartment were appreciated by our guests! We do really try to make each person feel at home, by answering their questions and giving tips and hints about what we have ourselves discovered over the years. It is true we are a TV-free zone - it is sometimes nice to have a holiday from that too! Yes, the location really is unbeatable and, as we have said before, we specifically wanted to become owners of a home in Cannaregio where real Venetians live ... and eat :) There are excellent restaurants with clients who return time and again in our immediate neighbourhood, and menu lists without those dreadful pictures of pre-cooked dishes of the tourist trap eateries. We look forward to welcoming anyone at our home who would like to feel like an authentic Italian Venetian during their stay. Cannaregio is the city's most northerly 'sestiere' stretching from the train station in the west to the 'Arsenale' in the east. The northern quays look out towards the islands in the lagoon. To the south the Canal Grande bounds the 'sestiere'. It is a quiet area, one of the most unspoilt by tourists, criss-crossed by canals, characterised by small shops, simple bars and artisans' workshops. The apartment is situated on a small canal near the Campo dei Mori, one of the prettiest quarters. There are excellent restaurants frequented by Venetians on the Fondamenta della Misericordia, a step away from our quiet alleyway. While not being at all 'touristy', the apartment is situated so that Rialto is about 10 minutes walk away, and San Marco about 20 minutes. San Zaccaria (for a convenient direct boat to the Lido Beach) is about 25 minutes away on foot - the walk is fantastic, and, like us, you will probably take much longer because of all the marvellous sights en route! Other Activities: The Lido beach is a 40-min-boat ride away. Rates are for occupancy by 3/4 people. FOR 1 OR 2 PEOPLE, TAKE OFF 20% !!! 1 week = 7 nights No arrival on Saturdays if the preceeding guest is leaving on that same day (cleaning problems). Please contact us to ask.